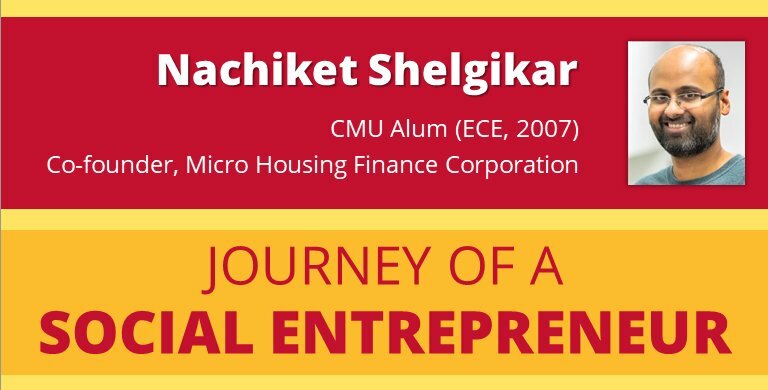 Join SABA & GEC in hosting our upcoming speaker, Mr. Nachiket Shelgikar (CMU alum, ECE'07), for an interactive session on his journey as a social entreprenuer. He left his lucrative job in Investment Banking with Deutsche Bank to co-found Micro Housing Finance Corporation (MHFC) in India. Come learn from him on how to build a profitable social enterprise. Mr. Shelgikar hails from India. He attended CMU for his BS in ECE. After graduating from CMU in 2007, he started his career as an Investment Banker with Deutsche Bank in London. In 2008, he returned to India to co-found Micro Housing Finance Corporation. MHFC's aim was to provide housing finance for lower income households (mostly in the informal sector) in urban India. MHFC raised its first round of equity funding in 2009, its first round of debt funding in 2011 and became profitable in 2012. Over the next few years, MHFC hit numerous milestones and in 2018 was acquired by the $45B conglomerate Aditya Birla Group.